From satirical underground comic book characters to alpha reptiles of the late '80s and early '90s, the ascension of the Teenage Mutant Ninja Turtles is a quintessential pop culture success story. TV, movies, music, books, toys (my god, the toys)--there wasn't a marketing opportunity missed by the Turtles brain trust. 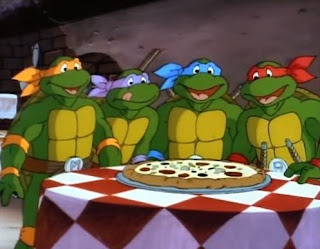 As the wellspring from whence all consumer goods came, the Teenage Mutant Ninja Turtles cartoon occupies a special place in the hearts of TMNT fans. We delve into the mythology, the minutae, and the merchandise in an especially sentimental discussion. This episode doesn't ask if the beloved series was crassly commercial (it most certainly was), but invites us to find within the profit motive and the artistic impulse a symbiotic entertainment entity that enthralled a generation.